Makeover and refresh your rooms with just a single touch! 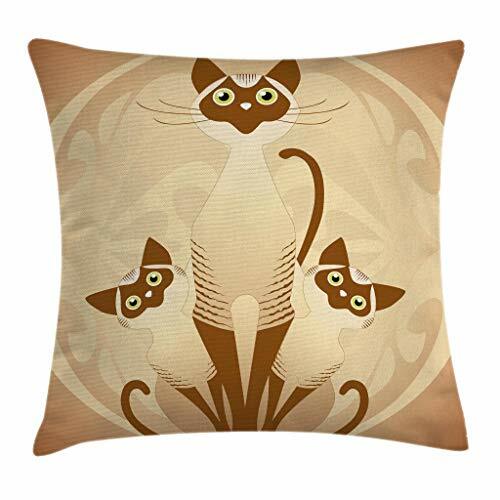 Start with these fun and decorative throw pillow covers. These unique designs match well with various color palettes of your sofa, couch, bed, bedding, rugs, curtains, bench, seating and all other decor accessories. Perfect for your home, office, playroom, kids room, cafe, study, studio, club, bar and others. Very durable and environmentally friendly, no dye substance harming the health of you and your family. Colors won't fade thanks to new digital printing methods. A perfect gift idea for your mom, dad, sister, brother, grandma, wife, husband and all other beloved ones with many of surprising designs. You can find a design for everybody and every interest in our Ambesonne Amazon Collection. They will be shocked by the superior quality of the item when they open the present. Customized, personalized products are very popular. As manufacturers of digital printed home textiles, we follow current trends and bring you the latest home fashion. Either a gift to your family or friend, relative or boyfriend girlfriend, or to yourself, the item should be interesting and authentic. The digital images we display have the most accurate color possible, however due to differences in computer monitors, we cannot be responsible for variations in color between the actual product and your screen. Due to manual measurement, please kindly allow 1-2 cm discrepancy. This is ONLY the pillow cover, sold WITHOUT the insert. MADE FROM - 100% Spun Polyester - WATERPROOF, High Quality Fabric. Highly unique. Versatile. FUN. FEATURES - Vivid colors & Clear image. NO FADING - No dyes harming health of your family. View More In Pillow Covers.